This product requires the base game theHunter: Call of the Wild™. This content requires the base game theHunter: Call of the Wild™ in order to play. The reserve wardens Conni and Doc have received a new shipment of equipment and thanks to Robert Sommer's connections, they were able to get their hands on a tent and a ground blind. These new items will make your hunting experience in both Hirschfelden and Layton Lake District even more complete. 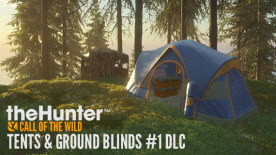 Setting up tents will create fast travel points almost anywhere you wish (although remember that in-game camping fees apply) which makes it great for exploring new areas and traveling to parts of the map that are particularly dense in the animal species you would like to hunt. The ELITE 2 TENT is a two-man tent suitable for all weather conditions. The patented high-tech Mosquito Wall 2.0, tested under severe conditions in northern Scandinavia, is proven to decrease user blood loss by almost 5% compared to its previous generation. That's a lot of blood! This award-winning product also includes a large storage container that'll turn your mobile home into a fully functional outpost. The tent makes it possible to access the store and purchase new gear for your inventory as well as rest up after a hard day of stalking and tracking. Just remember that placing, as well as fast traveling, to a tent creates noise which means you might spook some of the nearby animals. A maximum of 8 tents can be placed in each reserve at the same time. You can dismantle and move a tent at any point. Available in: White, Blue, Pink, Green and Camo. The ground blind offers the ultimate portable camouflage but it also functions as weather protection. Once deployed, it provides excellent visibility concealment and unrestricted shooting angles in almost every direction. The most notable features include the ability for it to be deployed almost anywhere, decreased visibility, and room for up to 2 hunters inside. Please remember that setting up a ground blind does create noise and might spook nearby animals. A maximum of 16 ground blinds can be deployed in each reserve at the same time. You can dismantle and move a ground blind at any point. Available in: Timber and Conifer.